Virgin Galactic's WhiteKnightTwo spreads its wings and chalks up mileage flying to Oshkosh, Wisconsin to appear at Experimental Aircraft Association's (EAA) AirVenture convention. The flying launch platform can support suborbital space tourism as well as toss small satellites into Earth orbit. VirginGalactic unveiled a new partnership Tuesday that pushes the throttle forward onits plans for commercial suborbital space travel and a new small satellitelaunch capacity. The dealinvolves Abu Dhabi?s Aabar Investments and Virgin Galactic, the commercialspaceliner group bankrolled by British billionaire Sir Richard Branson tofly ?pay-per-view? customers to the edge of space. Specifics of the partnership, which includes Aabarinvesting $280 million in Virgin Galactic in return for an equity stake, wereoutlined today at the Experimental Aircraft Association?s (EAA) AirVenture convention inOshkosh, Wisc., which is now under way. To date,Virgin Galactic has been wholly owned and funded by Branson?s Virgin Group. Thenew flush of Aabar money is also targeted to fund a small satellite launchcapability making use of the WhiteKnightTwocarrier plane, now undergoing extensive trial runs. TheWhiteKnightTwo (WK2) mothership - christened ?Eve? after Branson?s mother -flew into the AirVenture air show yesterday for its debut public demonstrationflight in Oshkosh. As thelargest all-composite aircraft ever built, the WK2 was designed and built byMojave, Calif.-based Scaled Composites, a firm now owned by Northrop Grummanand founded by aerospace master craftsman, Burt Rutan. The WK2 isdesigned to haul the six-passenger/two-pilot SpaceShipTwo to launch altitude,and then release the spacecraft so it can begin its suborbital flight.SpaceShipTwo is likely to be unveiled publicly in December and then begin itsown set of in-flight evaluations. 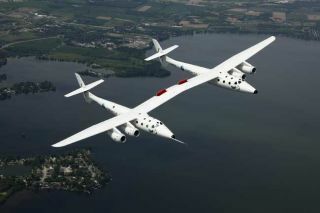 Branson isslated today to be onboard VMS Eve as a member of the crew for a demonstrationflight at the air show. To date, the WK2 had flown some 15 times, expanding itsperformance capabilities prior to its cross-country hop to the Oshkoshconvention. ?It?s abusy day,? said Virgin Galactic President Will Whitehorn. ?This is a bigdeal?and for us it?s an important strategic move,? he told SPACE.com ina pre-signing exclusive interview. Aabar is avery savvy investor, Whitehorn said. ?What was particularly exciting, when webegan discussions with Aabar, is that they were prepared to commit to doingsomething that we?re very, very keen to develop quickly?which is a satellitelaunch vehicle.? Whitehornsaid the deal is not going to change VirginGalactic?s space program from the point of view of space tourism or spacescience using SpaceShipTwo. ?What it isgoing to do is change the speed which we can now start the satellitedevelopment work,? Whitehorn added. Whitehornsaid a business plan is being evolved by working very closely with Surrey SatelliteTechnology Limited, a leading small satellite company based in Guildford,United Kingdom. That group has already delivered operational space missions fora range of applications including Earth observation, science andcommunications. ?The resultof this deal with Aabar, we?ll have satellite launch capability within threeyears,? Whitehorn said. Aabar will invest approximately $280 million and take around a 32 percent stake in Virgin Galactic?s holding company. Aabar has committed some $100 million extra to fund a small satellite launch capability, subject to the development of a full business plan. Aabar will gain exclusive regional rights, subject to regulatory clearances, to host Virgin Galactic tourism and scientific research space flights. Aabar has plans to build a science center and spaceport facilities in Abu Dhabi. Accordingto a Virgin Galactic issued press statement, the new infusion of cash means thespaceliner company is fully funded through to its commencement of commercialsuborbital operations. Branson?sVirgin Group has invested over $100 million in Virgin Galactic since itsformation in late 2004. AabarInvestments PJSC is an investment company headquartered in Abu Dhabi and is onthe Abu Dhabi Securities Exchange. It directly invests in various sectorsincluding energy, infrastructure, real estate, automotive and financialservices companies. Its largest shareholder is the International PetroleumInvestment Company, which in turn is wholly owned by the Government of theEmirate of Abu Dhabi.